Commercial credit is the creation of modern times and belongs in its highest perfection only to the most enlightened and best governed nations. Credit is the vital air of the system of modern commerce. It has done more — a thousand times more — to enrich nations than all the mines of the world. Quoted from a speech by Daniel Webster in the Senate at Washington, March 18, 1834. Location. Marker has been reported permanently removed. It was located near 40° 42.779′ N, 74° 0.559′ W. Marker was in New York, New York, in New York County. Marker could be reached from Church Street near Park Place, on the right when traveling north. Touch for map. Marker was at or near this postal address: 99 Church Street aka 30 park Place, New York NY 10007, United States of America. Touch for directions. 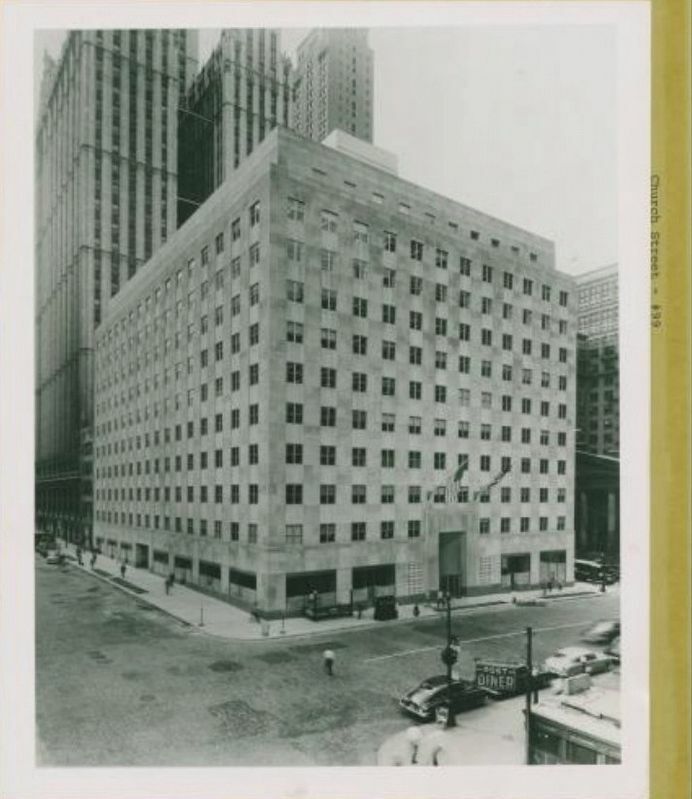 As headquarters for Republic Aircraft and later Dun & Bradstreet. 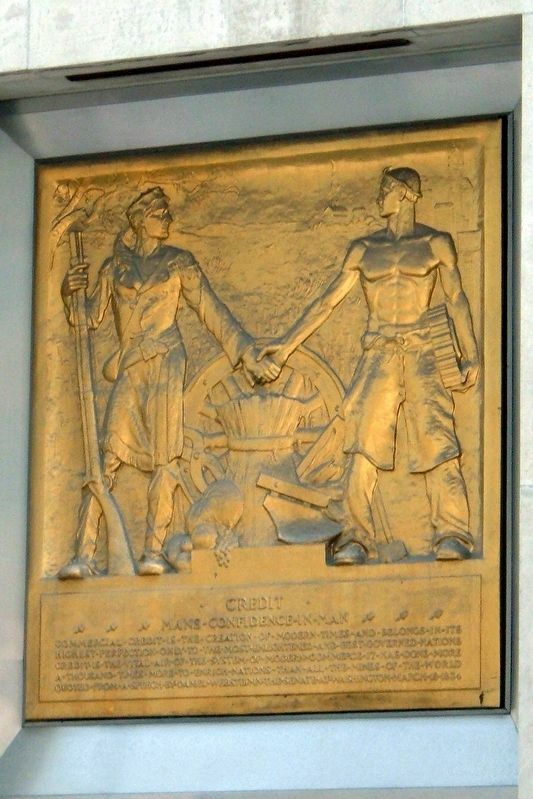 As The Moody's Building, the plaque was over the doors in the main entrance alcove. (within shouting distance of this marker); St. Peter's Free School (within shouting distance of this marker); Pierre Toussaint (within shouting distance of this marker); In Memory of Elizabeth Ann Bayley Seaton (within shouting distance of this marker); St. Florian (within shouting distance of this marker). Touch for a list and map of all markers in New York. More about this marker. This beautiful bronze frieze was removed during the demolition of the building in 2008. Rather than transport it to their new offices, Moody's opted for a reproduction of it there. The builders then destroyed the original by recycling it. This entry is for archival purposes. The Four Seasons Hotel/Private Residences New York Downtown, also known as 30 Park Place. More. Search the internet for Credit. Credits. This page was last revised on April 14, 2019. This page originally submitted on April 11, 2019, by Larry Gertner of New York, New York. This page has been viewed 45 times since then. Photos: 1, 2, 3. submitted on April 11, 2019, by Larry Gertner of New York, New York. • Bill Pfingsten was the editor who published this page.